If you’re like me, you love to make things. When I was a kid I’d scrounge around the house and find stuff that was broken or being thrown away and I’d make something out of it. Like many kids, I also loved to invent Songs and Stories. When I grew up I just kept making and inventing because I enjoyed it, and that became my work. Later I decided to share some of the things I had learned to do with kids (as an artist-in-schools) and then through Earth Arts NW. ​I’ve been very lucky to work with amazing kids and teachers who always teach me something new. On this page I’ve posted a few activities that you might like to do! Also, if you like stories, here’s a LINK to some Folk Tales invented by and with kids. After inventing a story about Lewis and Clark, 4th and 5th graders at Harvey Scott School (in Portland, Oregon), built props and costumes for a performance of their story. a cloth tipi, totem pole hats and costumes, like Merriweather Lewis's Jacket (above). This Jacket is made from one piece of felt. It has a belt and side ties. The pattern is below. Here's one of my favorite songs created with 3rd grade kids. became the best of friends. ​Listen to the song below. 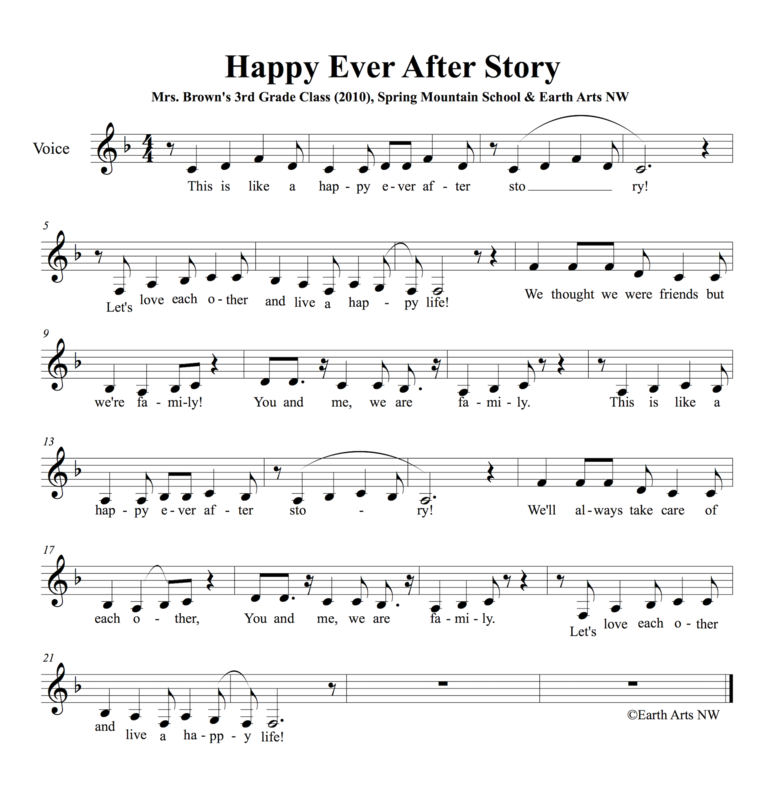 Then download the sheet music and story. If you want to do the activities inside the book, just print and go! I've worked with hundreds of kids making species masks and each child made a beautiful piece of eco-art. The kids made Bears, Snakes, Beavers, Frogs, Lizards, Owls, Mountain Goats, Salmon, Eagles and more! See samples of their work Here. To make a Bear Mask, just download the pattern and instructions below.